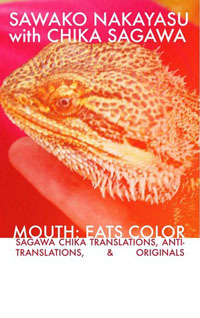 Sawako Nakayasu’s Mouth: Eats Color is enthusiastic. It’s enthusiastic about the plural nature of meaning, about disavowing loyalty to any single language, about the act of translation as a kind of breakage. Her own poetry which often has the quality of being exuberant but measured, folds into this new book of translations as if she is having a conversation with not only Chika Sagawa but the work itself as a separately conscious entity. Or perhaps more accurately the book is in the act of collapsing several conversations, continually re-engaging the same subject on various planes. The collection tests the flexibility of language and Sawako Nakayasu isn’t particularly gentle about it. But being gentle is for writing tributes and Mouth: Eats Color is more of an elongation, a circular extension of the text. And while she’s very polite, there’s muscle behind the way she translates, assembles, dissembles, resembles. “Promenade,” a poem repeatedly translated in Mouth: Eats Color changes its first line from “Seasons change their gloves” to “Season bag” to “Seasonal gloves” to “Seasons change their gloves,” every variation slipping easily into the next until they stop reading like re-translations of the same poem so much as chorus. The flow between her poems and Chika Sagawa’s poems offers up questions of where translation ends and collaboration begins, or if the act of translation is even possible—posits that even if content were able to sync perfectly between two completely different languages it might not survive the desire to insert authorial perspective. The collection asks that the reader consider the point when a translation deviates from the original just enough to become an entirely new work and offers up no answers except to say that the authenticity of a poem never mattered in the first place. Sawako Nakayasu doesn’t seem sad about the inherent obstacles of translating poetry, actually she seems pretty buoyant—bouncing between 2-3 languages and shuffling phrases like a deck of cards. She asks that the reader skips pages, or not. She asks that the reader looks up French words, or not. She, very softly, complicates the reading experience. She translates the same poem again and again, no derivation being further from the original in meaning than the next—they are all translations with the same level of accuracy because this book asks that we throw away our tools of measurement not because accuracy does not matter but because it is an impossible task. The translator dances around the primary text, makes small non-invasive steps towards the poem but the original and the translation can never overlap in meaning, which is not to say that it is “less than” the primary text. I keep returning to the poems that utilize more than one language. Yes, they are taunting and yes, I like it. The words I cannot understand—are they extending the poem, repeating the words I do recognize, or perhaps they mean nothing? It is possible that they exist as beautiful placeholders of a meaning I am being asked to insert. The dialogue extends towards the reader and the offer is exciting. It is easy to mourn the limitations of any single language. It could be said that language is a reflection of its correlating culture and that experience is growing increasingly cross-cultural, leaving language a bit crippled to conduit experience accurately. Sawako Nakayasu isn’t phased by the limitations of language, she just goes ahead and uses all the languages at her disposal and it feels like a relief. There’s a recognition of the deficiency of any single language as a conduit for experience, or possibly that a loyalty to a single language limits experience. Sawako Nakayasu considers the text without interrogating it. She exercises Chika Sagawa’s poems, pulls at it like taffy without exhausting the material. I imagine she is probing for limits and just discovering that they are further out than expected and I imagine she finds this exciting. I am excited too.